Unfortunately, your registration has been declined by the auctioneer. You can contact the auctioneer on +44 (0)7808 737694 for more information. You are the current highest bidder! To be sure to win, log in for the live auction broadcast on 27 Feb 2019 11:00 GMT or increase your max bid. 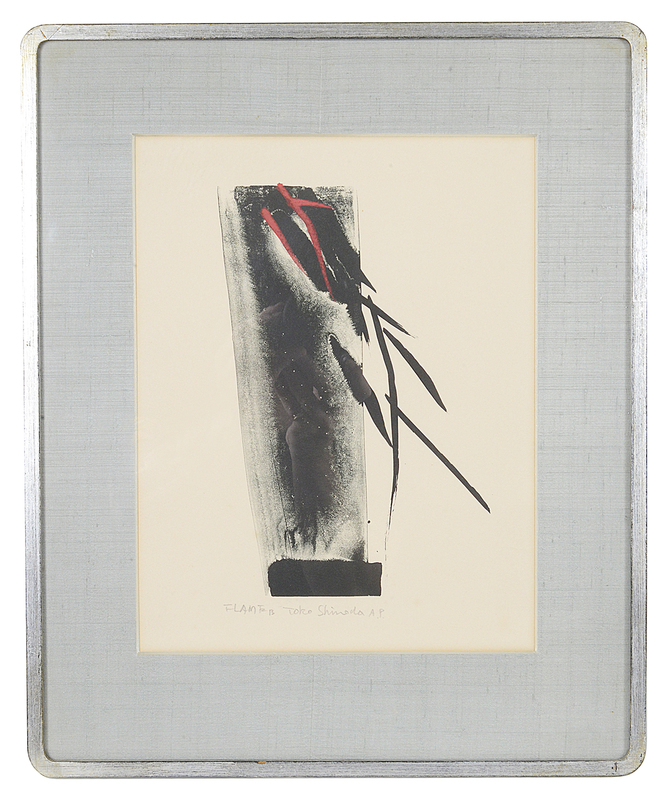 'Flame', Artist's Proof, lithograph, signed in pencil lower margin, mounted in original silvered frame, Kato framers label verso. total frame: 47.7 x 39.4cm approximately. Condition: Fair to good, with little wear to paper or frame. We are happy to offer an in-house packing and posting service for most non-fragile items. Please contact us for a quote. All lots should be collected on the day of the auction, Thursday 28th February or on Friday 1st March until 3pm. Please arrange for large items of furniture to be collected during this time. Following these dates, uncollected items of furniture, large decorative works of art and large paintings will be available for collection from our warehouse by appointment only. All other uncollected items will be available for collection at our office based at Ripley Arts Centre, 24 Sundridge Avenue, Bromley, Kent BR1 2PX from 9:30 a.m. to 4:30 p.m. Monday - Friday for two weeks after the sale. We are able to offer an in-house packing and posting service for most non-fragile items. Please contact us for a quote. We hold regular Antiques and Collectables Auctions, with colour catalogues, on-line catalogues and Live bidding. These auctions take place regularly at Farleigh Court Golf Club, Old Farleigh Road, Nr Selsdon, Surrey CR6 9PE. This venue has plenty of free parking and is a short taxi ride from East Croydon Station with direct links to London. The Company trades as Catherine Southon Auctioneers & Valuers Ltd. The Company’s registered office is: Lygon House, 50 London Road, Bromley, BR1 3RA. Company Registration Number 08020183. Registered in England and Wales. All you need is your computer and an internet connection and you can make real-time bids in real world auctions at the-saleroom.com. You don’t have to be a computer whizz. All you have to do is visit www.the-saleroom.com and register to bid - it’s just like being in the auction room. A live audio feed means you hear the auctioneer at exactly the same time as other bidders. You see the lots on your computer screen as they appear in the auction room, and the auctioneer is aware of your bids the moment you make them. Each auction is prepared in advance and is on public view at the saleroom for one day before the sale, and the morning of the sale. No passes or appointments are required. All lots are offered subject to Catherine Southon Auctioneers & Valuers Ltd’s Conditions of Business. Estimates are published as a guide only and are subject to review. The actual hammer price of a lot may be higher or lower than the range of figures given and there are no predetermined starting prices. Estimates may be subject to revision. Published estimates are exclusive of buyer’s premium and VAT. All lots are subject to reserves. The reserve price is never higher than the low pre-sale estimate. A buyer’s premium of 21.6% is applicable to all the lots in this sale. The buyer’s premium is inclusive of VAT at the current standard rate (20%). Lots are normally offered for sale under the auctioneers margin scheme and VAT is payable on the buyer’s premium by all buyers. Lots marked with a dagger † will be offered under normal UK VAT rules and VAT will be charged on both the hammer price and the buyer’s premium. All auctions are on public view the day before the sale and on the morning of the sale. All prospective bidders are encouraged to attend the pre-sale exhibition and view the lots in person. If this is not possible, we will be pleased to provide a brief condition report where practical. All condition reports are provided in good faith. Buyers are reminded that it is their responsibility to satisfy themselves of the condition of lots. All weights and measurements are approximate only. Please refer to Conditions of Business for further information. To bid with us you must register to obtain a bidding number. You will be asked to provide proof of identity. All lots sold will be invoiced in the name and address in which the paddle has been registered and will not and cannot be transferred to other names or addresses. If you instruct an agent to bid on your behalf, you will need to provide a letter of authority to this effect. Catherine Southon Auctioneers & Valuers Ltd is pleased to execute bids on behalf of clients unable to attend the sale in person. All bids should be submitted in writing and in good time, no later than 10.00am on the morning of the sale. Lots will be purchased as cheaply as possible (subject to other bids received, reserves and competition in the saleroom). It will be possible to arrange auction room telephone bidding, but subject always to the availability of lines and staffing. These services are offered free of charge and are subject to our Conditions of Business. Lots purchased online with the-saleroom.com will attract an additional charge for this service in the sum of 4.95% of the hammer price plus VAT at the rate imposed. Please note that the full amount owed must be transferred. Catherine Southon Auctioneers & Valuers Ltd will not accept transfer charges. All bank transfer/commission charges must be paid by the buyer. There is no charge for payments by UK registered Debit Card. We do not accept American Express. We are pleased to accept a Sterling Banker’s Draft or a Building Society cheque drawn on a recognised UK bank or building society. Cheques are not acceptable tender unless agreed in advance by Catherine Southon Auctioneers & Valuers Ltd.
Cash payments will not be accepted above the amount of £6,000. (iii) any additional notices and terms printed in the sale catalogue, in each case as amended by any saleroom notice or auctioneer’s announcement. (b) As auctioneer, Catherine Southon Auctioneers & Valuers Ltd acts as agent for the Seller. Occasionally, Catherine Southon Auctioneers & Valuers Ltd may own or have a financial interest in a lot. “Reserve Price” (where applicable) is the minimum Hammer Price at which the Seller has agreed to sell a lot. The Buyer’s Premium, Buyer’s Expenses and Hammer Price are subject to VAT, where applicable. (a) THE COMPANYs knowledge of lots is partly dependent on information provided by the Seller and THE COMPANY is unable to exercise exhaustive due diligence on each lot. Each lot is available for examination before sale. Bidders are responsible for carrying out examinations and research before sale to satisfy themselves over the condition of lots and accuracy of descriptions. (b) All oral and/or written information provided to Bidders relating to lots, including descriptions in the catalogue, condition reports or elsewhere are statements of THE COMPANY’s opinion and not representations of fact. Each lot is sold by the Seller with any and all errors of description, faults and imperfections. All weights and measurements are approximate and should not be relied upon as fact. Estimates may not be relied on as a prediction of the selling price or value of the lot and may be revised from time to time at THE COMPANY’s absolute discretion. (a) THE COMPANY shall refund the Purchase Price to the Buyer in circumstances where it deems that the lot is a Counterfeit. (b) Subject to Condition 4(a), neither THE COMPANY nor the Seller: (i) is liable for any errors or omissions in any oral or written information provided to Bidders by THE COMPANY, whether negligent or otherwise; (ii) gives any guarantee or warranty to Bidders and any implied warranties and conditions are excluded (save in so far as such obligations cannot be excluded by English law), other than the express warranties given by the Seller to the Buyer (for which the Seller is solely responsible) under the Conditions of Business for Sellers; (iii) accepts responsibility to Bidders for acts or omissions (whether negligent or otherwise) by THE COMPANY in connection with the conduct of auctions or for any matter relating to the sale of any lot. (c) Without prejudice to Condition 4(b), any claim against THE COMPANY and/ or the Seller by a Bidder is limited to the Purchase Price for the relevant lot. Neither THE COMPANY nor the Seller shall be liable for any indirect or consequential losses. (d) Nothing in Condition 4 shall exclude or limit the liability of THE COMPANY or the Seller for death or personal injury caused by the negligent acts or omissions of THE COMPANY or the Seller. (a) THE COMPANY has absolute discretion to refuse admission to the auction. Before sale, Bidders must complete a Registration Form and supply such information and references as THE COMPANY requires. Bidders are personally liable for their bid and are jointly and severally liable with their principal, if bidding as agent (in which case THE COMPANY’s prior and express consent must be obtained). (b) THE COMPANY advises Bidders to attend the auction, but THE COMPANY will endeavour to execute absentee written bids provided that they are, in THE COMPANY’s opinion, received in sufficient time and in legible form. (c) When available, written and telephone bidding is offered as a free service at the Bidder’s risk and subject to THE COMPANY’s other commitments; THE COMPANY is therefore not liable for failure to execute such bids. Telephone bidding may be recorded. THE COMPANY and the Seller make no representations or warranties as to whether any lot is subject to import, export or copyright restrictions. It is the Buyer’s sole responsibility to obtain any copyright clearance or any necessary import, export or other licence required by law, including licenses required by law under the International Trade in Endangered Species (CITES). (a) The auctioneer has discretion to refuse bids, withdraw or re-offer lots for sale (including after the fall of the hammer) if (s)he believes that there may be an error or dispute, and may also take such other action as (s)he reasonably deems necessary. (b) The auctioneer will commence and advance the bidding in such increments as (s)he considers appropriate and is entitled to place bids on the Seller’s behalf up to the Reserve Price for the lot, where applicable. (c) Subject to Condition 7(a), the contract between the Buyer and the Seller is concluded on the striking of the auctioneer’s hammer. (d) Any post-auction sale of lots shall incorporate these Conditions of Business. (a) Unless otherwise agreed in advance, payment of the Purchase Price is due in pounds sterling immediately after the auction (the “Payment Date”). (b) Title in a lot will not pass to the Buyer until THE COMPANY has received the Purchase Price in cleared funds. THE COMPANY will generally not release a lot to a Buyer before payment. Earlier release shall not affect passing of title or the Buyer’s obligation to pay the Purchase Price, as above. (c) The refusal of any licence or permit required by law, as outlined in Condition 6, shall not affect the Buyer’s obligation to pay for the lot, as per Condition 8(a). (d) The Buyer must arrange collection of lots immediately after the sale on the day of the auction, or until 12noon on the day after the auction; failing this, only on prior agreement, a mutually convenient day agreed by The Company and the Buyer. Purchased lots are at the Buyer’s risk from the earlier of (i) collection or release to a nominated carrier (ii) 5 working days after the auction. Until risk passes, THE COMPANY will compensate the Buyer for any loss or damage to the lot up to a maximum of the Purchase Price actually paid by the Buyer. THE COMPANY’s assumption of risk is subject to the exclusions detailed in Condition 5(d) of the Conditions of Business for Sellers. (e) All packing and handling of lots is at the Buyer’s risk. THE COMPANY will not be liable for any acts or omissions of third party packers or shippers. (i) disclose the Buyer’s details to the Seller to enable the Seller to commence legal proceedings. (a) If the Buyer pays the Purchase Price but does not collect the lot within 10 working days of the auction, the lot will be stored at the Buyer’s expense and risk at THE COMPANY’s premises or in independent storage. (b) If a lot is paid for but uncollected within 1 month of the auction, following 60 days written notice to the Buyer, THE COMPANY will re-sell the lot by auction or privately, with estimates and reserves at THE COMPANY’s discretion. The sale proceeds, less all THE COMPANY’s costs, will be forfeited unless collected by the Buyer within 2 years of the original auction. (a) THE COMPANY will use information supplied by Bidders or otherwise obtained lawfully by THE COMPANY for the provision of auction related services, client administration, marketing and as otherwise required by law. (b) By agreeing to these Conditions of Business, the Bidder agrees to the processing of their personal information and to the disclosure of such information to third parties world-wide for the purposes outlined in Condition 11(a) and to Sellers as per Condition 9(i). (a) All images of lots, catalogue descriptions and all other materials produced by THE COMPANY are the copyright of THE COMPANY. (b) These Conditions of Business are not assignable by any Buyer without THE COMPANY’s prior written consent, but are binding on Bidders’ successors, assigns and representatives. (c) The materials listed in Condition 1(a) set out the entire agreement between the parties. (d) If any part of these Conditions of Business be held unenforceable, the remaining parts shall remain in full force and effect. (e) These Conditions of Business shall be interpreted in accordance with English Law, under the exclusive jurisdiction of the English Courts, in favour of THE COMPANY.